GoBoilers.net: Purdue - Penn State Recap: Does Anyone Really Want To Read This? Purdue - Penn State Recap: Does Anyone Really Want To Read This? Purdue came out strong and scored a field goal on their first drive. 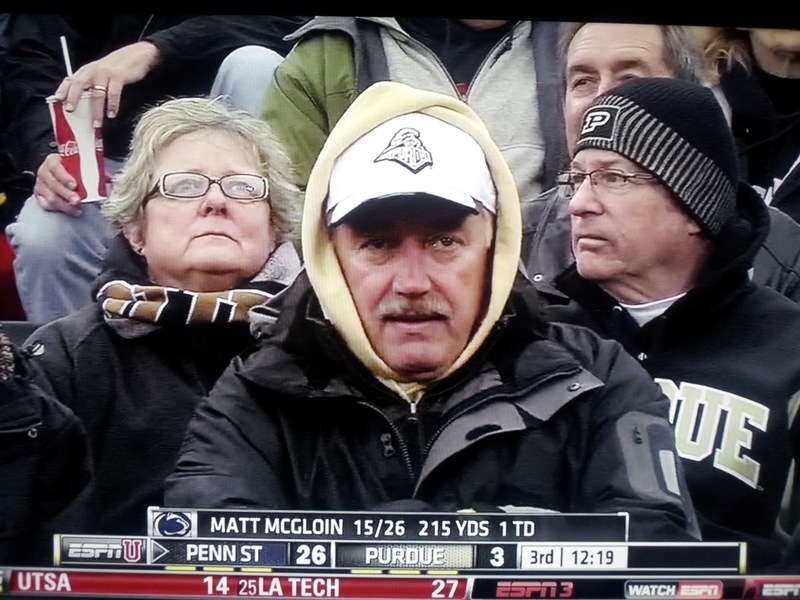 The Boilermaker defense then did their best impression of a sieve and gave up 34 points in a row. 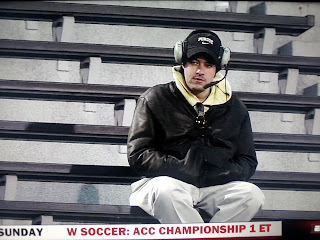 Meanwhile, the starting quarterback, Robert Marve acted like he only practiced the first drive all week and was replaced in the third quarter. The Boilers then scored against the 4th string defense to make the score a little less lopsided. 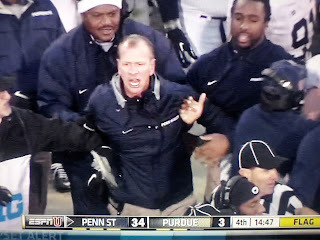 Coach Danny Hope (underlined for potential future games) acted like he's never won a Big Ten game and Offensive Coordinator Gary Nord remained defiant in his superiority over all offensive minds in college football. Somehow, these guys have been so bad that Defensive Coordinator Tim Tibesar and his 2-down CFL defense goes yet another week without getting the majority of the blame. Purdue has now lost 5 straight games. 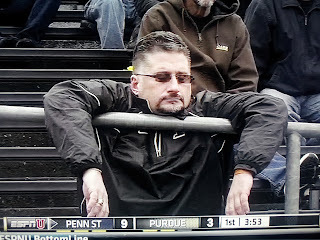 "I know where this game is headed - I'm gonna take a nap. Luckily there's a lot of room to stretch out." No caption needed. 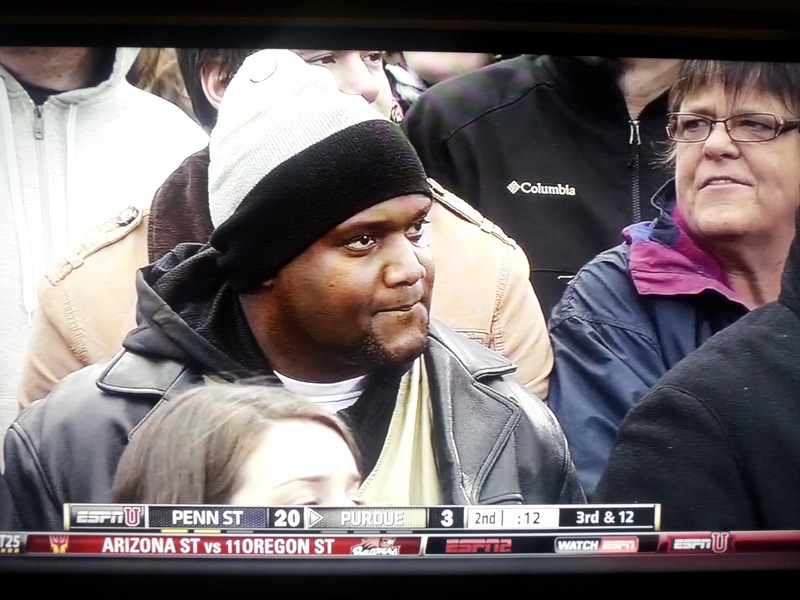 Although, notice the lady in the upper right? She is forming the "F" in the F-bomb that she's about to drop. Seriously, if you have a recording of the game, check it out. "Ahh!!! My eyes!!! I can't watch this anymore! What's that weird shadow behind me?" "Football? Penn State? I thought actual lions were going to be here. Hopefully the guy next to me with the fake hair doesn't see my rifle..."
The empty 3rd quarter stare we've become so familiar with. 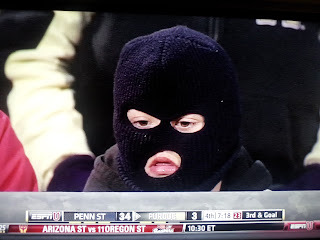 I'm pretty sure part of Penn State's sanctions include "no video of naked people and the football team in the same shot." "Hey! I want to take my clothes off too!" 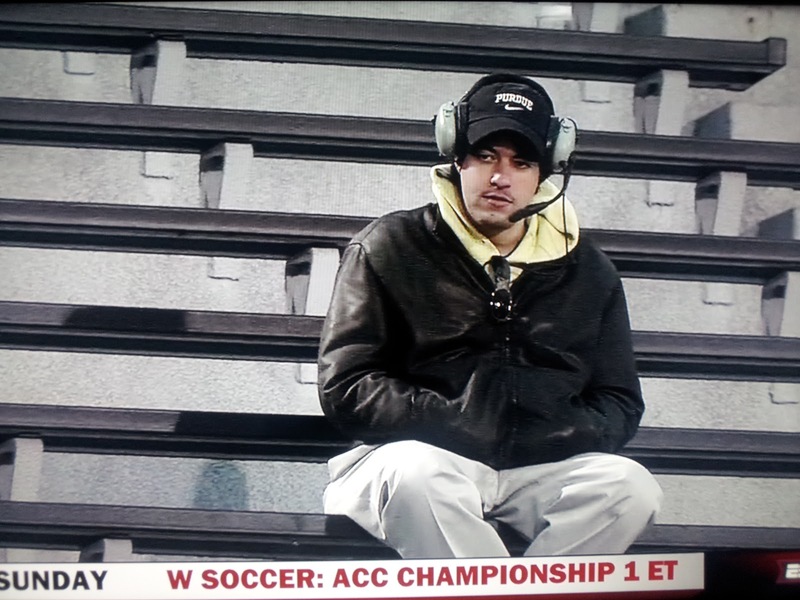 Frank showed up to announce the Women's Soccer ACC Championship game a day early. 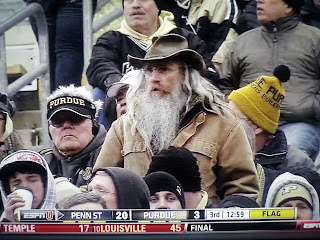 He soon realized his mistake and that he was at a Purdue football game when he noticed he was the only one that was still there. People actually stick around in the second half of women's soccer games. This is the "Paper Bag" treatment from a 3-year-old. 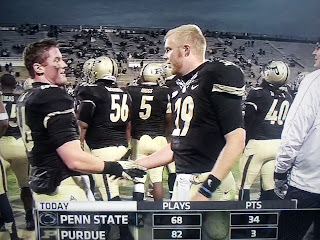 "Hey, nice job Caleb - we beat them in plays! Plus, there are more people here than there were at this point of the Wisconsin game! Progress!" 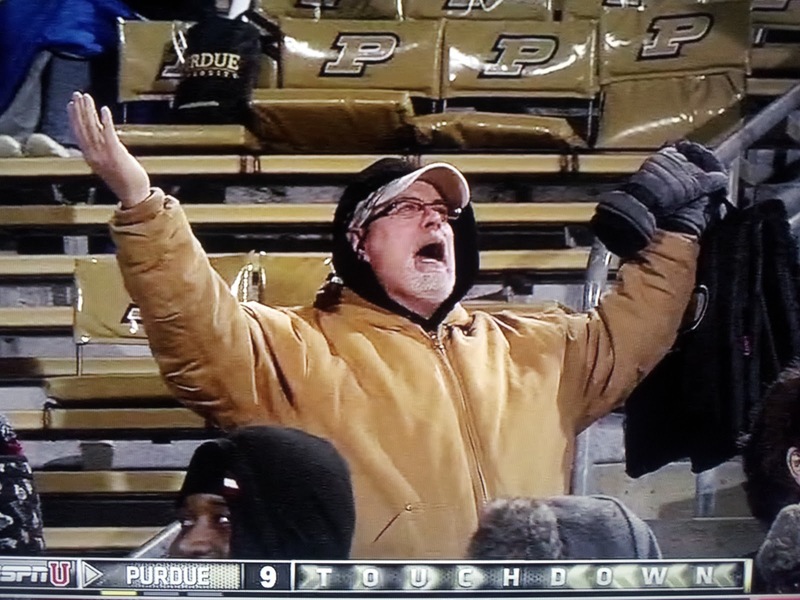 "Lord, thank you for letting us score a touchdown. But why won't you let us kick the extra point?? We haven't had a single kick blocked this week and I haven't suffered enough!" If any of you were featured in the above pictures, let us know and we'll give you a prize for keeping us entertained during an absolutely awful game. Huge week this week as Kirk made up $58 and pulled into the lead! Kirk moves up to $25.50. Erik lost and is down to $24. This race is close, so at least it gives you something to look forward to for the last three weeks of the football season! 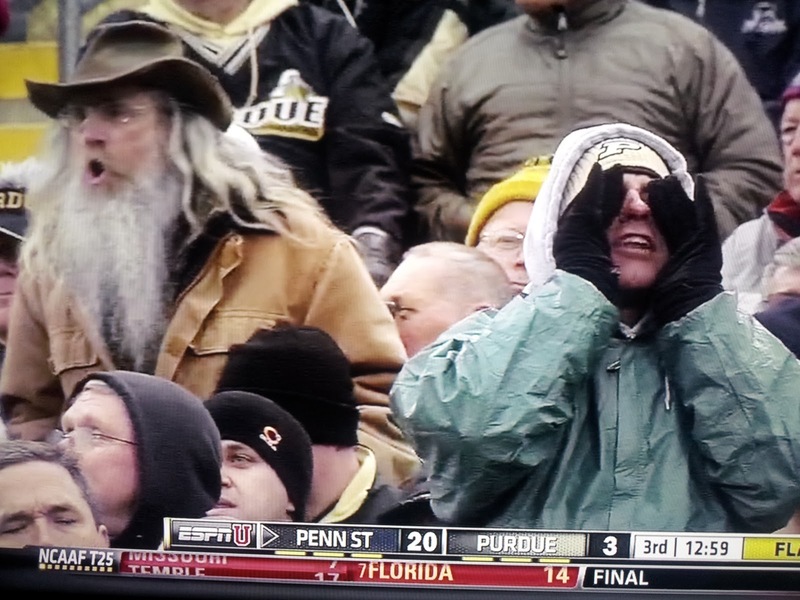 Purdue - Iowa Recap: Oh My Gosh, We Won! 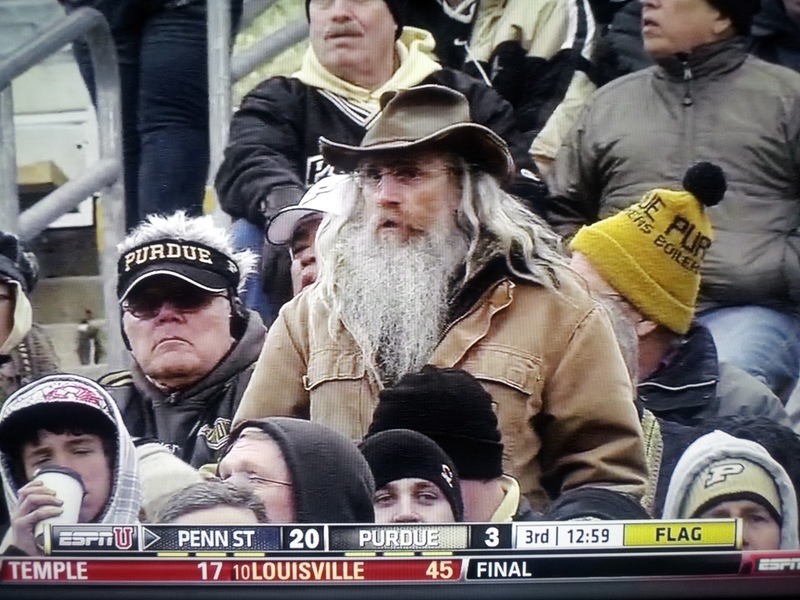 Purdue - Bucknell Recap: Spoiler Alert!